A man who police believe is responsible for several bombings in Austin this month blew himself up early Wednesday morning as officers attempted to arrest him, bringing what authorities and residents hope will be an end to a string of attacks that killed two people, injured more and shook Texas' capital city. Authorities have identified the man as 23-year-old Pflugerville resident Mark A. Conditt, and Gov. Greg Abbott said police had been tracking him for about 24 hours before his death. A criminal complaint and arrest warrant were filed against him Tuesday night. Police tracked Conditt to a hotel in Round Rock north of Austin before sunrise. As they waited for more officers to arrive, he drove away. Police followed, and Conditt drove into a ditch, where he detonated his own bomb and an officer shot at him. One officer was injured in the explosion. 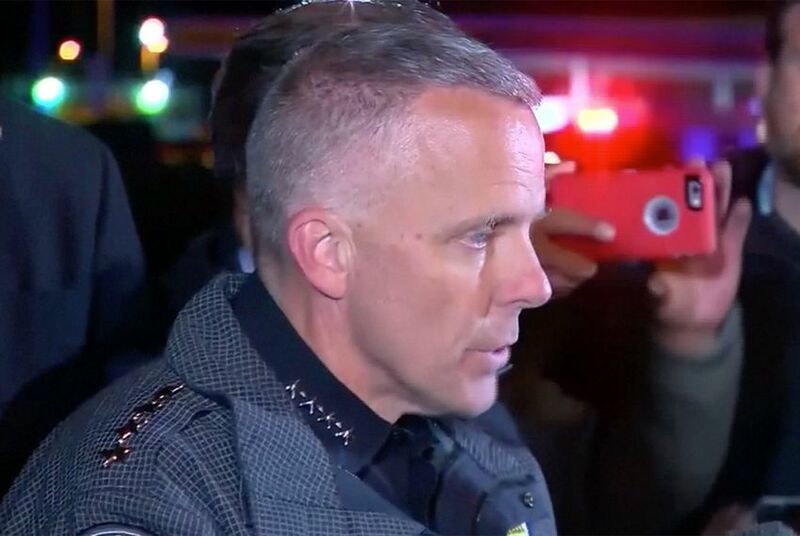 "The suspect is deceased and has significant injuries from a blast that occurred," said Brian Manley, Austin's interim police chief. Manley added, "This is the culmination of three very long weeks for our community." At a news conference later Wednesday, Manley said police don't know what the motive was for the attacks but that a 25-minute-long video by Conditt — described by Manley as a "confession" — shed more light on his thinking. "We're never going to be able to put a ration behind these acts," Manley said, adding that Conditt made no mention of "terrorism" or "hate" in the video. "It is the outcry of a very challenged young man," Manley said. The video also included "indications of actions he was willing to take in the future," Manley said. In the video, Conditt describes in detail seven explosive devices; all seven are accounted for and "no longer in play," Manley said. Abbott noted in a conference call with reporters earlier Wednesday that authorities also couldn't rule out whether anyone else was involved in the attacks. Investigators on Wednesday had gone through Conditt's home, where they found bomb-making materials in a room, and his parents' house. They were also poring through social media and paperwork in hopes of learning more and interviewing his two roommates, family members and neighbors, Abbott said. Police had evacuated a large area around Conditt's home as they searched it Wednesday. Questions still remain about the suspect and the reasons behind his actions. Reports indicate that Conditt was homeschooled. He attended Austin Community College from 2010 to 2012, but didn't earn a degree, according to an ACC spokesperson. Conditt kept a low profile on social media. The KVUE television station in Austin reported that he worked for Crux Manufacturing in Pflugerville. He started there at age 19, and was let go last August because he wasn't meeting expectations, a company employee told the station. He is being blamed for all five bombs that had exploded in or near Texas’ capital city before Wednesday morning. A sixth bomb was found at a FedEx facility, but didn’t detonate. Two people died in the bombings — not including the suspected bomber — and several others were seriously injured. The first three bombings happened in East Austin. Each of those involved a package left at the front of a person’s house that exploded. Two people were killed — 39-year-old Anthony Stephan House on March 2 and 17-year-old Draylen Mason on March 12. Then on Sunday night, the bomber appeared to switch up his methods. A bomb exploded in a southwest Austin residential neighborhood, seriously injuring two people. Law enforcement officials said a tripwire device ignited that blast. Authorities declared that a sophisticated “serial bomber” might be at work. Then another package explosion occurred Tuesday morning at a FedEx facility in Schertz, which is outside of San Antonio. Authorities said that package was headed for Austin. The unexploded bomb was found at a second FedEx facility hours later. Conditt's decision to send bombs by FedEx seemed to provide authorities with a break in the case. FedEx said Tuesday that it was able to hand over "extensive evidence" related to the packages and who shipped them. And Abbott said Wednesday that surveillance video was obtained at the FedEx store of Conditt mailing the packages. Investigators also had cellphone records indicating his phone was near each of the bombing sites and other key locations. "There were multiple pieces of evidence and information about the same vehicle that he was using, showing up at various locations, that tied him possibly to these crimes," Abbott said. Abbott also said Conditt purchased several materials that were used in the bombings at Home Depot. Those included five signs that said something like "Children at Play," Abbott said. "It is my information that that trip wire... was tied to one of those signs that he purchased," Abbott said. Elected officials from across the state and nation celebrated law enforcement's actions in the case on Wednesday. President Donald Trump celebrated the news on Twitter, posting, "AUSTIN BOMBING SUSPECT IS DEAD. Great job by law enforcement and all concerned!"